The nitrate content of beetroot juice helps lower blood pressure, research has shown. 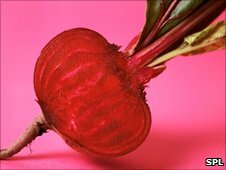 "We showed that beetroot and nitrate capsules are equally effective in lowering blood pressure, indicating that it is the nitrate content of beetroot juice that underlies its potential to reduce blood pressure," she said.. The decrease in blood pressure after taking beetroot juice was much more pronounced in men. Researchers say this could be because women are better at naturally processing nitrate in their bodies.